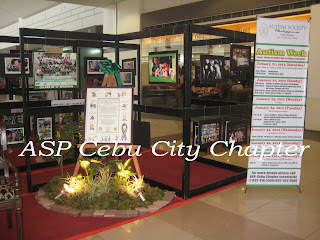 By Sandra L. Espina, ASP Cebu Chapter President. A sunny Saturday morning woke the special children up for a 7am '"Angels Walk" at SM City Cebu last January 21, 2012 participated along by our loving ASP parents, caregivers, relatives and NGO's. This kicked off the Autism Week to the Sinulog beat for a two-round ground mall walk with the morning sunshine shining in the east. Two corner stops were set up as reward stations for our special kids, offering fresh pineapple bread, juice, bottled water and hard boiled eggs. The children with autism gathered the following day for a 9am Sunday Mass bringing along with them their offertory gifts. Two adolescent special children namely, Kalvin Roa and Eric Borja, in their vibrant green " One With Autism " shirts, read the Prayers of the Faith. Drums started to beat loudly signalling the special kids to line up for another indoor "Angels Walk". The Photo exhibit taken by the Cebu Digital Photographers headed by Mr. Paul Gotiong and Gabe Hortelano entitled "Colors of A-Spectrum" was set up and arranged by Kuya Joachim and Kuya Cristoph Espina. Ms. Tata Cinco-Sy of ABS-CBN, Ms. Hester Jane Casing-Amigo, AVP Marketing of SM City Cebu, Ms. Artemia Degamo of DSWD accompanied by ASP Cebu Chapter Officers Sandra Espina, Cyril Borja, Carlina Roa and other ASP Members and CWA joined in cutting the Ribbon to formally open the 5th "Color of A-Spectrum Exhibit". 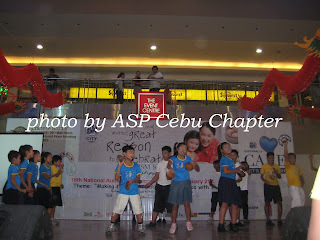 The week was filed with Adaptation activities in SM City Cebu like hair cut activity, grocery shopping, childrens' rides and games at SM Storyland. Others opted to watch the "Dinosaur Live". The Autism Lectures included the "Magna Carta", discussed by a DSWD representative in relation to the theme: "Making Rights Real to Filipinos with Autism" . The lectures were attended by parents, educational therapists, some SPED students, clinical instructors, and OT/PT students. The culminating activity was held in the SM Event Centre with a talent showdown from seven special public and private schools. Zapatera Public SPED School rendered the opening salvo with their Sinulog Dance formally dressed in their barong tagalog and maria clara costumes. Kyte Strings and Prime Center rendered their dance prayer and duets. Stages, Adams Jenny, Mandaue Central Public school and REACH Center had a Sinulog interpretation dance presentation coupled with punky dance numbers together with their parents, caregivers and teachers. SM mascots Lionel and Sgt. surprise presence lifted the differently abled children to their seats and rushed to the stage to join them. Smiles, laughter filed the air and warmth the hearts of our special kids as they gather as ONE that afternoon! ASP-President Sandra Espina, Zapatera SPED Teachers and ASP parents were interviewed by ABS-CBN Mr. Leo Lastimosa. Thank you SM for hosting the ASP-Cebu activities, ABS-CBN for covering Live the one week activities and to the NGO's for supporting the AUTISM Advocacy in Cebu! You can contact the ASP Cebu Chapter President Sandra Espina at 09173207425.